The five Christian denominations closely associated with the Joint Declaration on the Doctrine of Justification(JDDJ) are taking part in a private consultation and public events this week to discuss how to take the document further. 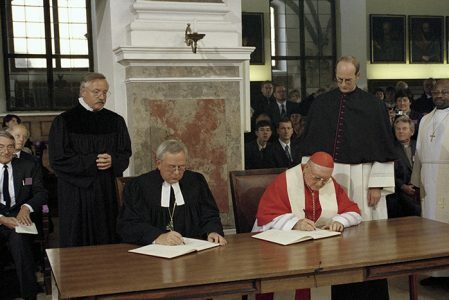 The JDDJ was originally agreed by the Roman Catholic Church and the Lutheran World Federation in 1999. The significant ecumenical text has been described as resolving the doctrinal dispute at the heart of the Reformation; and has since been adopted or affirmed by the World Communion of Reformed Churches, the World Methodist Council and the Anglican Consultative Council. Next PostChurch Army in Action!